MacDonald's workshops empower the beginning teller, quickly turning novices into eager tellers. Workshops can be tailored to the needs of schools, libraries, and festivals. 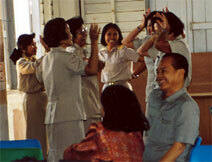 Thai teachers learn to tell "Monkey and Rabbit"
"The exuberance that existed in the sessions was contagious. "...Professor Spencer G. Shaw, University of Washington. "If 100 people each learn 6 new stories today, [they did] and they share one story in each of 6 programs that are attended by 25 children, how many children will enjoy a program enriched by the culturally diverse wealth of our folklore heritage? Answer: 15,000 children!" Leslie Molnar, Cuyahoga County Public Library.